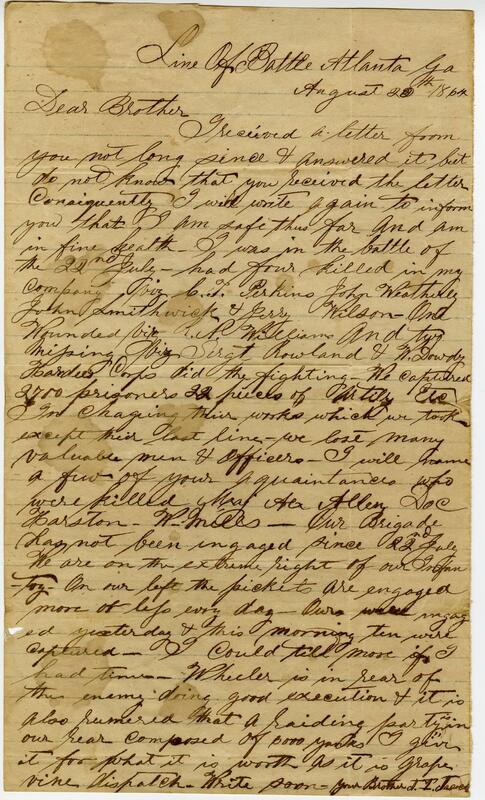 Item Description: A letter from J. J. Jacocks to his brother from the battle line around Atlanta. He describes several deaths that have occurred and a brief account of their situation. Item Citation: From Folder 7, in the Jonathan Jacocks Papers #372, Southern Historical Collection, Wilson Library, University of North Carolina at Chapel Hill. I received a letter from you not long since & answered it but do not know that you received the letter. Consequently, I will write again to inform you that I am safe thus far and am in fine health. I was in the battle of the 22nd July–had four killed in my company viz. C. T. Perkins, John Weatherby, John Smithwick, & Jerry Wilson. One wounded viz. R.P. William, and two missing viz. Sergt. Rowland & N. Dowdy Hardees Corps did the fighting. We captured 2700 prisoner 22 pieces of artillery etc. And charging their ranks which wee took except their last line. We lost many valuable men & officers. I will name a few of your acquaintances who were killed. Maj, Alex Allery, Doc Harston, W. Mills. Our Brigade has not been engaged since 22nd July. We are on the extreme right of our infantry. On our left the pickets are engaged more or less every day. Ours were engaged yesterday & this morning ten were captured. I could tell more if I had time. Wheeler is in rear of the enemy doing good execution & it is also rumered that a raiding party is in our rear composed of 6000 Yanks. I give it for what it is worth as it is grape vine dispatch. Write soon. Your brother, J. J. Jacocks. This entry was posted in Southern Historical Collection and tagged Battle of Atlanta, Civil War, Jonathan Jackock. Bookmark the permalink.